In a publishing site, the navigation settings for both navigation bars are in the same page. To get to the navigation management page, open the Site Settings page and click the Navigation link in the Look and Feel section of the page. 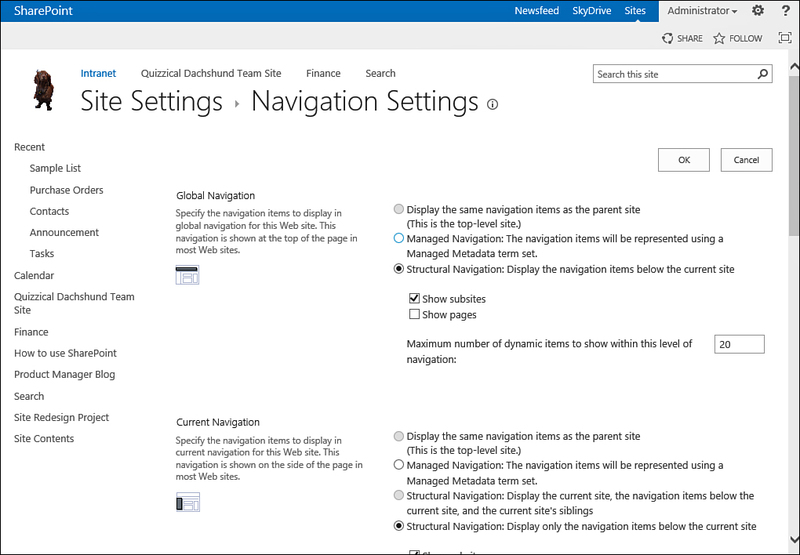 The Site Navigation Settings page opens, as shown in Figure 3. FIGURE 3. The Site Navigation Settings page. 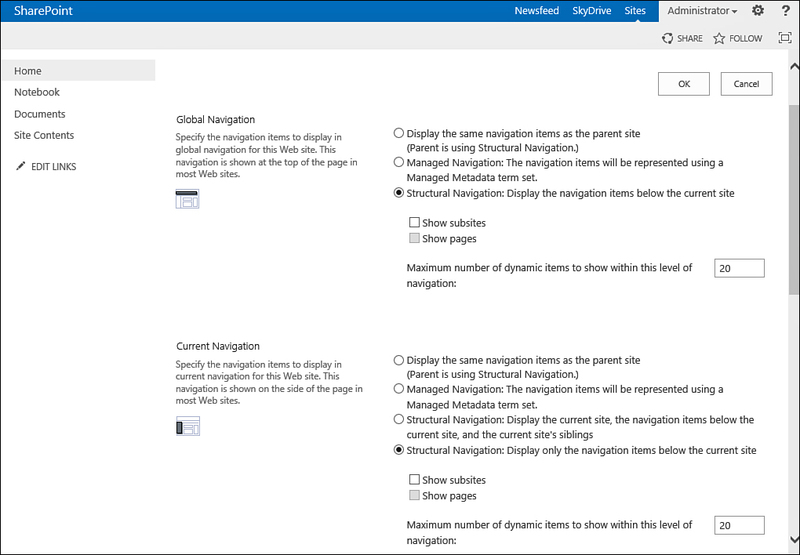 On the Site Navigation Settings page, you can define what links and headings each navigation bar will have—and you can add, remove, or change the order of those links. The top navigation bar is referenced on this page as Global Navigation, and the left navigation bar is called Current Navigation. In a subsite, this page has more options. On it, you can set whether the site should display the same top or left navigation options as its parent site or whether it should have its own set of navigation bar links. FIGURE 4 The Site Navigation Settings page for a subsite. If you choose either Display the Same Navigation Items as the Parent Site (available only if you are in a subsite) or Structural Navigation, the options to choose whether the navigation bars should show subsites under the current site and whether the navigation bars should show pages appear (refer to Figure 4). If you choose to use structural navigation or managed navigation, you will be able to modify the navigation for the site. Inheriting the navigation from the parent site means that to edit the navigation you have to go to the parent site’s navigation settings page.